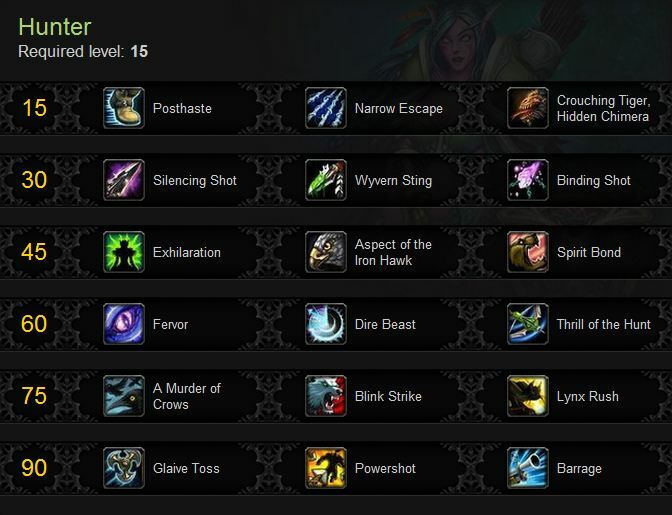 This page covers the various Hunter abilities and Glyphs as they will be in Mists of Pandaria, it does not cover builds. Yet. As this is written it’s still two months to the M of P launch and things might change. 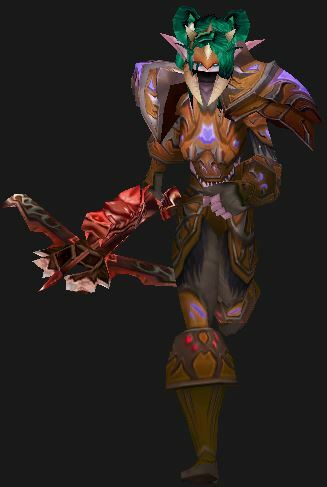 For now, check stuff out and think about what you will want for your Hunter, since the Cataclysm system will be scrapped. Feel free to add comments, if you’re so inclined. Any spec of Hunter can choose any one talent from each row. You will have six talents at level 90. You do not have to spend points in any given talent (or any ability,) you just pick ’em and use ’em. Obviously this means that any flavor of Hunter can have Silencing Shot. Again, you can pick one from any one row, regardless of your spec. Silencing Shot – Silences and interrupts. Wyvern Sting – Puts the target to sleep for awhile. Binding Shot – Enemies are tethered to your arrow and stunned if they move away. Exhilaration – Heal yourself and your pet. Aspect of the Iron Hawk – Increase ranged attack power and reduce incoming damage. Spirit Bond – You and your pet regenerate. Fervor – Restore focus Dire Beast – Summons a mighty beast to attack your target. 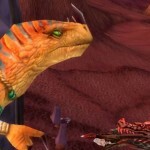 Thrill of the Hunt – Chance for next Arcane/Multi-shots to be free. A Murder of Crows – A flock of crows will attack your target. Blink Strike – Pet shadowsteps to target and does damage. Lynx Rush – Your pet charges from target to target, attacking each. 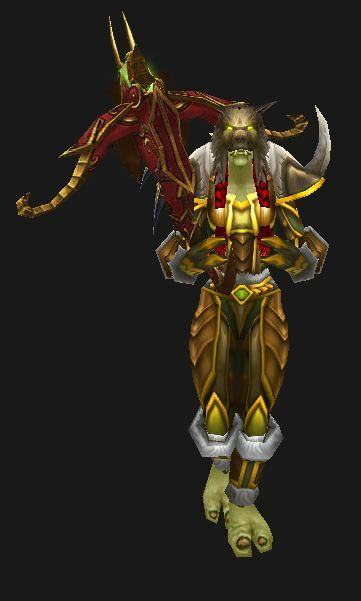 These talents are gone, though some of the functionality may have been rolled into other abilities or glyphs or talents.Sic em!, Bestial Discipline, Efficiency, Hunter vs. Wild, Improved Kill Command, One with Nature, Pathing, Rapid Killing, Improved Mend Pet, Improved Steady Shot, Suvival Tactics, Point of No Escape, Counterattack, Ferocious Inspiration, Hunting Party, Killing Streak, Longevity, Noxious Stings, Resistance is Futile, Resourcefulness, Sniper Training, T.N.T., Termination, Toxicology. Previously all specs of any class shared a pool of common abilities and the talents made the difference. 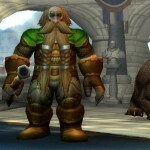 In Mists of Pandaria there is a smaller pool of abilities, the talents (which can be accessed by any spec,) and then a set of abilities unique to each spec. All of the abilties are acquired from your trainer as you level. As with talents you will not have to spend any points in any of these abilities. These are the abilities that all Hunters will eventually receive on their path to level 90. Naturally you’ll pick these up from your trainer as you level. If you want to level as fast as possible, then go here. 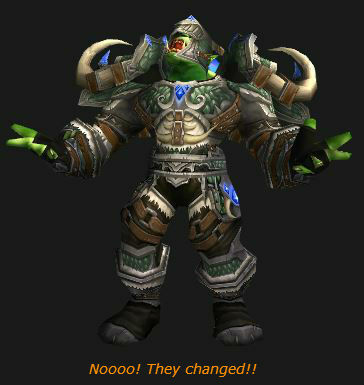 Most, not all, of these abilities have been tweaked from their Cataclysm versions. A couple are new, some were talents. Hover over the links for descriptions. Remember that you can still use the Dual Build ability (learned from your trainer.) As with the regular abilities you will learn these from your trainer as you level. Exotic Beasts (Passive) – Used to be part of the Beast Mastery talent. These are all the Hunter Glyphs in Mists of Pandaria. You will notice, right off, that Prime Glyphs are gone. You’re left with Major and Minor, three of each. They’re gained, 1 of each, at levels 25, 50, and 75. The third weapon slot is gone, but you can still equip ranged and melee weapons, just not at the same time. You can have your two swords or you bow/gun, but not both. Make a macro to swap weapons or use the equipment manager if you really want to use melee weapons. Or go fishing. Note in the “dead abilities” section that some of your melee strikes are gone. 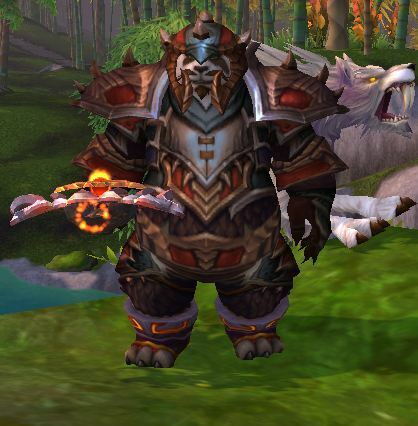 Hunters can fire ranged weapons in melee range, Pandaren hunters have a point blank stun which will be rather nice for getting out of tight spots. Pet talents are gone, rather they will have abilities appropriate to type and spec. It’s possible for your ranged attacks to be dodged, so the Expertise stat might become valuable, up to the dodge cap. It’s exact value will probably depend on the exact situation, gear level, PvE Vs. PvP, etc., just as it does in Cataclysm.